Christmastide ends on January 5, Twelfth Night. The readings for Epiphany follow, with posts discussing each one, except for the Psalm. The Psalm mentions kings from far away bringing gifts to honor the king’s son. Although David appears to have written this for his son, Solomon, it also prophesies Christ and His Kingdom. Over the years I have really come to look forward to and better appreciate Epiphany. It is always that much more special when this feast day falls on a Sunday. I hope that you have a blessed Epiphany. December 26 is full of history. 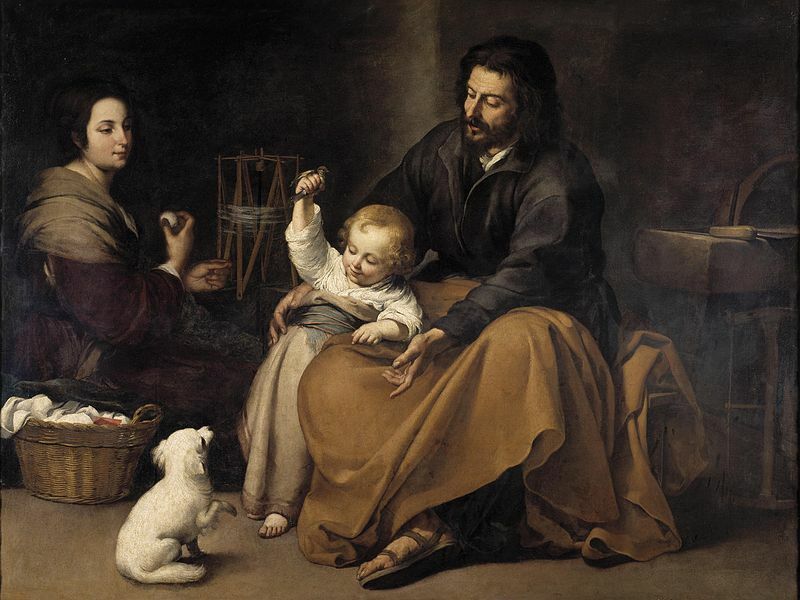 The Holy Family with dog, hangs in Madrid’s Museo del Prado. Bartolomé Esteban Murillo painted it between 1645 and 1650. He was born late December 1617, baptized January 1, 1618 and died on April 3, 1682. Murillo was a prolific painter of both religious and secular themes. Until the 19th century, he was Spain’s best known artist. His work influenced many other European painters, including Gainsborough. Stephen was the Church’s first martyr. Students of the Bible and readers who have been following my series on Acts this year, will recall his story. Saul of Tarsus — St Paul — had a huge role to play in Stephen’s stoning. Acts 7:44-50 – Stephen, temple court, apologetics, the history of the temple, Moses, Joshua, King David, King Solomon. The post also includes the account of his stoning in the last few verses of Acts 7. In Europe, St Stephen’s Day has been one of popular celebrations, sometimes revelry, as it comes right after Christmas. I watched the BBC Two Christmas special, The Sweet Makers, in which historian Dr Annie Gray brought a Christmas box to show the bakers and confectioners. It was a painted terracotta box that one dropped on the floor to open. Dr Gray said that one recipient wrote in his journal that he made a year’s salary with that Christmas box alone. He was the exception, not the rule! A popular traditional carol is Good King Wenceslas, which describes an event that took place on December 26. Wenceslas (c. 907 – 935) was a duke in Bohemia. The Holy Roman Emperor Otto I elevated him to a king after his brutal death, largely for his piety, just government and famous works of charity. Wenceslas was considered a martyr and a saint immediately after his death in the 10th century, when a cult of Wenceslas rose up in Bohemia and in England. Within a few decades of Wenceslas’ death, four biographies of him were in circulation. These hagiographies had a powerful influence on the High Middle Ages conceptualization of the rex iustus, or “righteous king”—that is, a monarch whose power stems mainly from his great piety, as well as from his princely vigor. “Good King Wenceslas” is a Christmas carol that tells a story of a Bohemian king going on a journey and braving harsh winter weather to give alms to a poor peasant on the Feast of Stephen (December 26, the Second Day of Christmas). During the journey, his page is about to give up the struggle against the cold weather, but is enabled to continue by following the king’s footprints, step for step, through the deep snow. Poor Wenceslas — or Wenceslaus, real name Václav — was dogged by political and family problems. His own brother killed him. His grandfather, Bořivoj I of Bohemia, converted to Christianity thanks to Sts Cyril and Methodius. Wenceslaus’s mother, Drahomíra,was a pagan who converted and was baptised when she married Vratislaus I, Duke of Bohemia. His paternal grandmother, Ludmila of Bohemia, was responsible for young Wenceslaus’s education. Ludmila was at Tetín Castle near Beroun when assassins murdered her on September 15, 921. She is said to have been strangled by them with her veil. She was at first buried in the church of St. Michael at Tetín, but her remains were later removed, probably by Wenceslas, to the church of St. George in Prague, which had been built by his father. he took control of the government. He placed the duchy under the protection of Germany, introduced German priests, and favoured the Latin rite instead of the old Slavic, which had gone into disuse in many places for want of priests. To prevent disputes between him and his younger brother Boleslav, they divided the country between them,[clarification needed] assigning to the latter a considerable territory. Wenceslas also exiled his wicked mother. He had to contend with enemy rulers and adversarial regional alliances during his reign. Worst of all was his murderous brother, Boleslav. a group of nobles allied with Wenceslas’s younger brother Boleslav plotted to kill him. After Boleslav invited Wenceslas to the feast of Saints Cosmas and Damian in Stará Boleslav, three of Boleslav’s companions, Tira, Česta, and Hněvsa, fell on the duke and stabbed him to death. As the duke fell, Boleslav ran him through with a lance. What a man Wenceslas was. What a family he had. What piety and charity he displayed in the face of such adversity. Along with her grandson, Ludmila was also elevated to sainthood. Ludmila is the patron saint of Bohemia, converts, duchesses, widows and, not surprisingly, those who have problems with in-laws. Best wishes for a very happy Christmas to all my readers around the world! Have a marvellous day! I am adding a new one to the list. The great American poet Henry Wadsworth Longfellow wrote a poem, Christmas Bells, during the Civil War. Accounts differ as to whether he composed the poem in 1863 or 1864, but, whatever the case, Longfellow’s life during the Civil War years was not a happy one. What Saith the Scripture? has an excellent article from 2001 by Tom Stewart on Longfellow, his family, Christmas Bells and related Scripture verses. A summary and excerpts follow. We are all sighing for the good sea breeze instead of this stifling land one filled with dust. Poor Allegra is very droopy with heat, and Edie has to get her hair in a net to free her neck from the weight. Melting a bar of sealing wax with a candle, a few drops fell unnoticed upon her dress. The longed for sea breeze gusted through the window, igniting the light material of Fanny’s dress– immediately wrapping her in flames. Failing to stop the fire with the rug, he tried to smother the flames by throwing his arms around Frances– severely burning his face, arms, and hands. Fanny Longfellow died the next morning. Longfellow was still suffering from his burns when his wife’s funeral took place. He was also overcome by grief. He did not attend. Incidentally, the trademark full beard of Henry Wadsworth Longfellow arose from his inability to shave after this tragedy. How inexpressibly sad are all holidays. I can make no record of these days. Better leave them wrapped in silence. Perhaps someday God will give me peace. A ‘merry Christmas’ say the children, but that is no more for me. with a bullet passing under his shoulder blades and taking off one of the spinal processes. The Christmas of 1863 was silent in Longfellow’s journal. And the thousands of volunteers in our country who will give up their time to make someone else’s Christmas that little bit better: from faith inspired projects like the Churches Together initiative in my own constituency – to aid workers helping those in war-torn parts of the world. As we celebrate the birth of Christ, let us celebrate all those selfless acts – and countless others – that epitomise the values we share: Christian values of love, service and compassion that are lived out every day in our country by people all faiths and none. Let us take pride in our Christian heritage and the confidence it gives us to ensure that in Britain you can practice your faith free from question or fear. Let us remember those around the world today who have been denied those freedoms – from Christians in some parts of the Middle East to the sickening persecution of the Rohingya Muslims. And let us reaffirm our determination to stand up for the freedom of people of all religions to speak about and practice their beliefs in peace and safety. So this Christmas, whatever our faith, let us come together confident and united in the values we share. And wherever you are at this special time of year, let me wish you all a very happy Christmas. I could be mistaken, but I do not recall a religious message from a Prime Minister in decades. Well done, Mrs May. May God bless you and your husband this Christmas and in the year ahead. On Monday, November 27, 2017, First Lady Melania Trump welcomed a group of schoolchildren to the White House which she has transformed into a magical Winter Wonderland. I mentioned the gingerbread house last week. It is something to behold. the White House will host more than 100 open houses and many receptions. More than 25,000 visitors will walk the halls taking part in public tours. Unlike presidential palaces, it is considered the People’s House, and the Trumps have opened the doors to tens of thousands of Americans, many for special recognition, in addition to those attending tours. In addition to views of the other rooms — including the Blue Room with the main Christmas tree (also see) — that video also has an excellent extended close-up of the gingerbread house, complete with portico and columns. How did they make that? Wow! Along with millions of Americans, I am so grateful for such a wonderful First Family. No more Mao ornaments, as favoured by the Obamas. Thank goodness for that. Even worse were the Clintons’ White House displays. Please read the story at that link (content too indecent to summarise here). In closing, here is another video. Yes! Christmas makes a comeback! And the White House has never looked as beautiful as it does now. UPDATE: CNN announced they will be boycotting the Trumps’ White House Christmas party for the media. Press Secretary Sarah Sanders is delighted, and Trump says we should turn off CNN.